Obituary for Paul Simon Blodgett | Langeland Family Funeral Homes, Inc.
BATTLE CREEK - Paul S. Blodgett, 69, passed away Saturday, June 16, 2018. He was born February 22, 1949 to the late George and Dorothy (Smoke) Blodgett. Paul served in the U.S. Air Force as a jet mechanic during the Viet Nam War, from January of 1969 until honorably discharged in October of 1971. 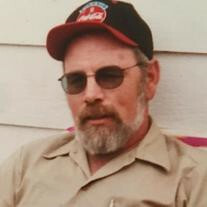 Paul is survived by his daughters, Shondell Hysell and Tara Parham; 7 grandchildren;3 great grandchildren; siblings, Linda (Theron) Ryan and Retha Dillon; and several nieces and nephews. He was preceded in death by his siblings, Cliff Blodgett and Sharron Cavanaugh. A graveside service will take place on Thursday, June 28th, 1:30pm at Ft. Custer National Cemetery. Arrangements by Langeland Family Funeral Homes, Memorial Chapel, 622 S. Burdick St. Memorials may be directed to the Wounded Warrior Project, www.woundedwarriorproject.org.